In the years after the 2008 economic crisis, both France and the United Kin gdom presented plans for the reorganization of their armed forces. In this thesis, it is studied how the economic crisis can explain these military reorganizations from a neoclassical realist perspective, which says that domestic constraints influence the path that state leaders are likely to pursue , while they also want to maintain and even increase their relative power position with regard to other states. These domestic constraints are determined by financial resources and immaterial resources. Immaterial resources consist of the shared ideology between the civil society and the national government. The presence of such shared ideology is considered a resource. The expectation was that the crisis caused a decline in both financial and immaterial resources, which then made the military organization unsustainable, making reorganization necessary to maintain power and capabilities. Content analysis and analysis of data from several databases was used to check these expectations. 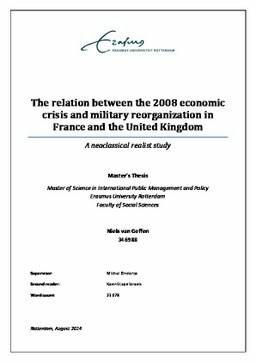 Evidence was found for a causal relation between the economic crisis in and the military reorganizations and that the reorganizations were seen as a measure to maintain and increase power and capabilities. However, only financial resources seem to have played a role, while the studied data gave absolutely no reason to believe that immaterial resources have influenced the development of the reorganization plans. The analysed trends and developments appeared to be very similar in both cases. Another finding was that the economic crisis only partly explains the military reorganizations. Other factors that appeared to very likely have played a role are the changing nature of modern warfare and the changing strategic landscape on a global level. Further research is required to determine the degree of importance these factors had for the military reorganizations.